One drawback of LED lighting is that as the bulb's output wattage grows, so too does the chip cooling system. But GE's new Energy Smart bulb's ingenious cooling design packs a 100W of power at a quarter the energy requirements of a standard A19 incandescent. To cram the necessary parts into the A19 shape, GE partnered with Nuventix to replace the conventional cooling fans with something they call a synthetic jet—essentially an oscillating membrane that helps dissipate the heat. In addition, the Energy Smart bulb emits at the 3000K color temperature and is rated at a 25,000-hour service life. 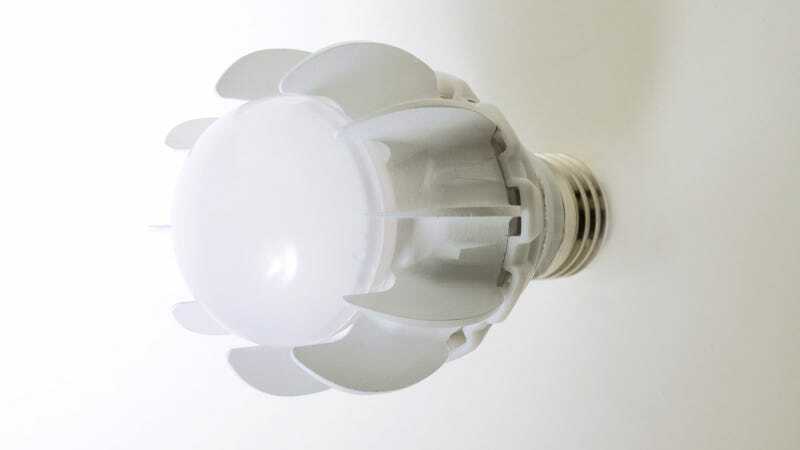 "Our innovation team has tackled a previously insurmountable technical challenge: cooling a 100-watt A-19 shaped replacement LED bulb without making it physically bigger," said Steve Briggs, general manager of LED systems, GE Lighting in a press release. "Each subsystem such as optics, electronics and thermals needed to be designed for miniaturization and cooperative performance. We explored the limits of what's possible and pushed far beyond industry expectations and competitors' thinking and product offerings."